Below is the first occurrence of the #MainBhiChowkidar by @narendramodi The tweet was dated March 15th 0900hrs IST. This hashtag was part of the campaign; we found this hashtag trending in India by 1100hrs. We were interested in studying the different facets of this campaign, in particular, name changes in the user name of the accounts, verified and others. Screen name / handle is restricted to 15 alphanumeric characters (letters A-Z, numbers 0-9) with the exception of underscores and name of the account is restricted to 50 alphanumeric characters, including special characters and emojis. Of the 1,268 verified handles (we reported 1,252 in our blog post on March 1st; 16 handles have been verified in the last 23 days), we found (as of March 24) 377 (29.7%) added Chowkidar to their user name. We found 370 of these 1,268 handles were from BJP (full list of the handles), 4 from INC, 2 from AAP, and 1 from RLD. Of the 370 BJP handles, 364 contains Chowkidar, 8 contains चौकीदार and 2 contain both Chowkidar & चौकीदार. Below is the table with the handles who changed their names. To understand the influence of this campaign, we collected tweets with #MainBhiChowkidar which amounts to 404,006. To study the username changes by the handles posting these tweets, we found 130,290 handles posting these 404,006 tweets. Of these 130K handles, we found 46,527 (35.7%) handles added Chowkidar or its variants (see below for more details) to their name. We found 99 different variants of Chowkidar being used in the names. Below is the list of the top 10 of the variants with their number of occurrences. We believe these variations could be because of the regional differences in the country. In the period of our analysis (9 days), we saw 3 INC handles add Chowkidar to their names and changed it back to not having Chowkidar (therefore these are excluded from the 377 handles mentioned earlier). Below is the table giving the 3 handles with their name changes. 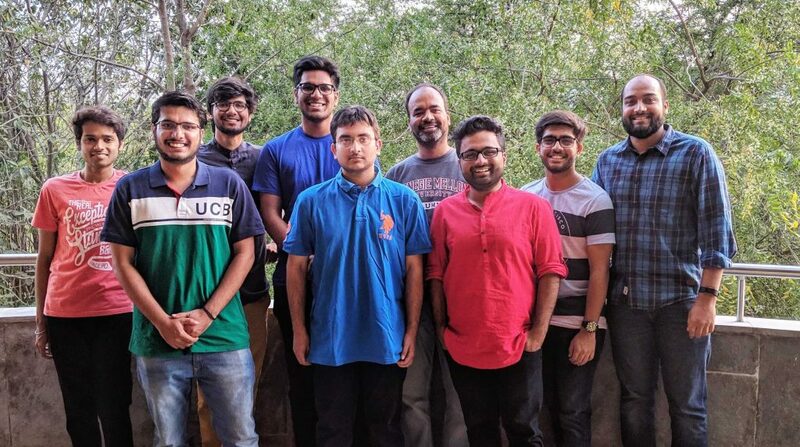 We analyzed username changes and name changes for the 45.9 Million followers of @narendramodi. We found 4,587 accounts changing their username to a variant of Chowkidar; some example are @ChowkidarMetoo, @chowkidaralka. 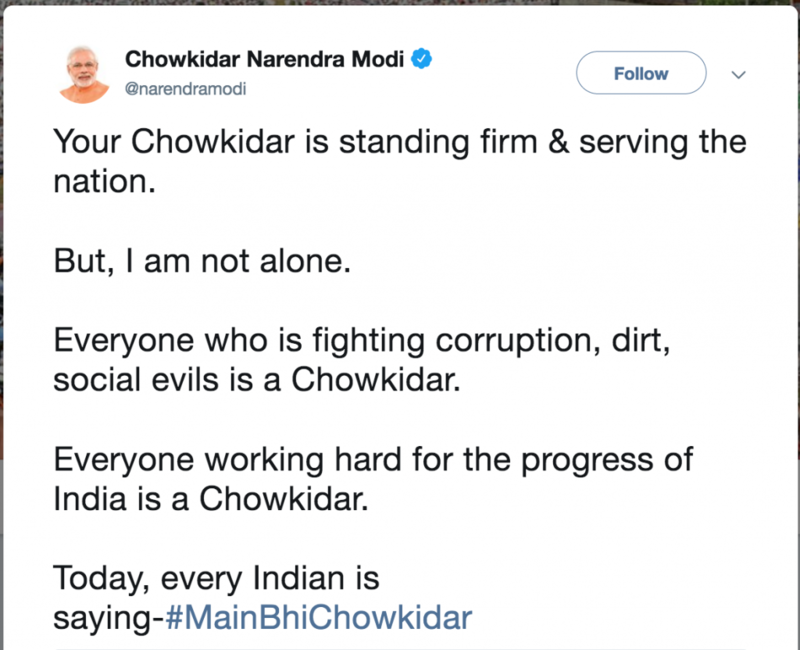 Here again, we found many variants of Chowkidar being used in the handle, top 5 variants were – chowkidar, chowkidarr, choukidar, chowkidaar, chowkidhar. 229,364 followers added Chowkidar to their name; top 5 variants were – chowkidar, चौकीदार, chaukidar, chowkidaar, chawkidar. These name changes during the campaign looks super exciting for us, as we have worked on the attribute (Username, Name, Description, Location, Language, Time zone, Profile pic) changes in Twitter in 2015 / 2016, captured in the paper “On the Dynamics of Username Changing Behavior on Twitter” We found 73.21% of 8.7 million users change their attributes on Twitter; about 10% change their username. Below is the graph from the paper showing the percentage of changes of the attributes along with the attributes. Attributes versus percentage of users who changed the attributes. Among the 46,527 handles who added Chowkidar, we also found 1,828 handles changed their name more than twice in these 9 days. Changes varied between 3 and 12. @KailashYadav_ changed the name in total of 22 times of which 12 had Chowkidar in it, below is the list of 12 handles. Among the 130K handles who posted tweets with #MainBhiChowkidar, some also changed their names to add “chor” or a variant of “berojgar”. We found 446 handles adding “Chor” to their names; top 5 variants are ‘chowkidar chor hai’, ‘#chowkidarchorhai’, ‘chowkidarchorhai’, ‘chowkidar hi chor hai’, ‘#chowkidarhichorhai’. We found 358 handles adding a variant of “berojgar”, top 5 variants are — ‘berojgar’, ‘berozgar’, ‘berozgaar’, ‘berojgaar’, ‘berojagar’. We found the 1st occurrence of ChowkidarChorHai by a verified handle in Sept 2018. With amazing students (many missing!) who are churning out these wonderful results! To access the complete dashboard with interactive graphs, and data, please visit here.